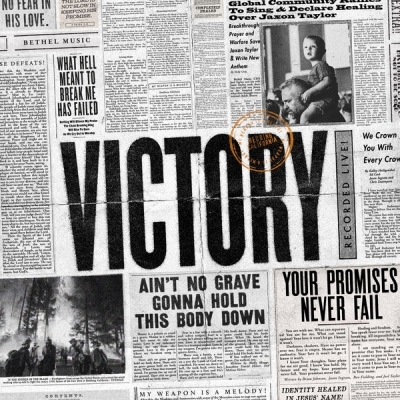 Marking the first Bethel Music Collective release in two years, VICTORY is now released. The 14 track collection stems from the personal journeys of Bethel Music, including miracles, a raging wildfire, a joy-filled adoption and battles with anxiety, fear and health. Josh Baldwin, Cory Asbury, Jonathan & Melissa Helser, Bethany Wohrle, Sean Feucht, Emmy Rose, Brian & Jenn Johnson, Kalley Heiligenthal, Paul & Hannah McClure and Hunter GK Thompson are found on VICTORY alongside friends including Molly Skaggs, Daniel Bashta & Harvest. Read More Marking the first Bethel Music Collective release in two years, VICTORY is now released. The 14 track collection stems from the personal journeys of Bethel Music, including miracles, a raging wildfire, a joy-filled adoption and battles with anxiety, fear and health. Josh Baldwin, Cory Asbury, Jonathan & Melissa Helser, Bethany Wohrle, Sean Feucht, Emmy Rose, Brian & Jenn Johnson, Kalley Heiligenthal, Paul & Hannah McClure and Hunter GK Thompson are found on VICTORY alongside friends including Molly Skaggs, Daniel Bashta & Harvest. This album has a more country feel than I was expecting. I might even say it has a Rend Collective beat to it, have a listen to 'Drenched In Love' to compare. But there is too much going on musically on this album to just say this is a copy the popular Rend Collective sound. There are so many amazing tracks that I'm sure fans of Bethel will fall in love with straight away. There are a great praise songs in 'Living Hope' and 'Christ Is Risen', then the track 'Ain’t No Grave' has this kind of DC Talk feel to it. For all the passion on this album, and there is buckets full of amazing worship songs to God, this great album actually feels like it has made a shift in musical styles compared to recent live worship album from other similar big churches. My only worry here is that this shift might have made this album now become more middle of the road music. I’ll leave that to you to decide. Yet what is at the heart of these songs is power and passion to the King of Kings. I love the opening to 'Every Crown', this song is a real gem of a track that is hidden at the back end of the album so keep it playing. What I will say about this album is that these songs are passionate about declaring that God has the Victory. Which is why I can see how the title of the album was chosen! As always with an album like this, the production is second to none, yet the move between tracks doesn’t feel as smooth as it could be. With all it's little issues this is still a very strong album. Our Album of the week is Bethel Music and 'Victory'. Have a Listen and tell us your favourite tracks!